This is a bit different: reviewing not the comic book itself, but the process of creating the comic. It reminds me again that sometimes, as a teacher and a writer, making the process transparent is as much a learning process as the product itself. I recently stumbled upon this wonderful website that details how a group of writers and artists in South Africa known as Umlando Wezithombeare are engaged in converting history books of their country into comic book format to make the material more accessible for the population. Easier to read than conventional books, the comics are aimed at conveying the seminal values of a free society and a sense of their own history to those beyond the reach of other kinds of written media because of poverty, illiteracy, geographic isolation, technological divides, and underdeveloped reading cultures. In fact, there were one million copies of the Mandela comic published and distributed throughout South Africa and my guess is that most of those homes were places where few updated textbooks were available. One of the artists glows with pride when he talks about people hanging up his artwork (ie, the comic) on their walls, showing us the power of images and words. 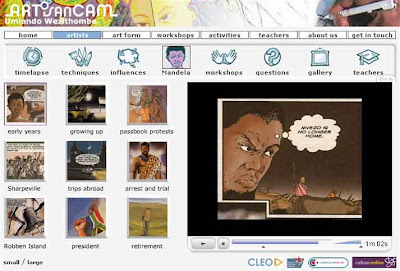 The main section of this fascinating website of Umlando Wezithombeare at work is a visual retelling of the life of Nelson Mandela and the video story intersperses interviews, images and screenshots from the comic book to create an engaging look at the man who spent years in jail under Apartheid only to emerge later as a leader of modern South Africa and a statesman on the global stage. I like how they have broken down the story of Mandela into video chapters, allowing the reader/viewer the opportunity to follow the thread of Mandela's life as they wish. It's an interesting mix to see pages from a comic flash over the screen as the people being interviewed continue their story. It's a sort of video/audio/comic mashup that holds potential for bringing storytelling in new directions, I think. The video compilations here show how the artists and writers involved in the Mandela comic book effort visited the Cartoon Museum in London to get an inside look at the format and use of comics to tell a story. There is also a web gallery with pages from the book and a neat timelapse video of one of the artists drawing a page from the book. One section even gives us an insight into a workshop for young writers as they move through the process of envisioning and creating their own comics. Add in a section for teachers that has an overview of the resources and possible activities for the classroom, and you come away realizing that they have put a lot of thought into this project and showed the possibilities of comics as an important storytelling device.